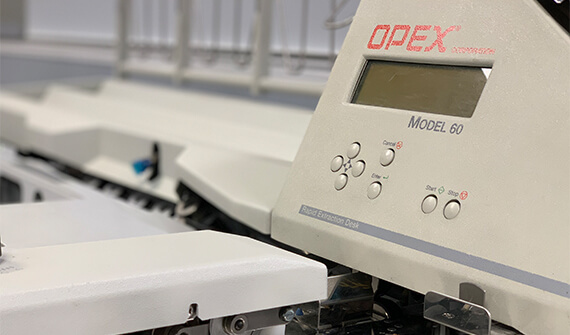 Built upon a legacy of nearly four decades of innovation, the OPEX Model 72™ raises the bar for envelope opening and content extraction. Advancements in cutting technology and feeder design make the best rapid extraction desk available even better. Designed with the operator in mind, the Model 72 is the perfect blend of ergonomics, ease-of-use and accessibility. The Model 72 provides an exceptional increase in measurable operator productivity. This all adds up to increased operator satisfaction and more efficient mail opening. 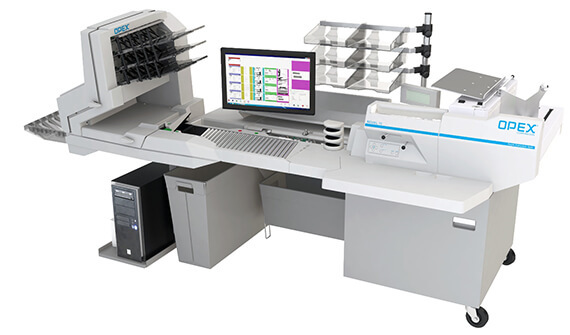 Without a doubt, the Model 72 is the most cost-effective and efficient way to open and extract mixed mail. Milling cutting offers a smaller cut depth which significantly reduces the potential of cutting contents. This makes the Model 72 perfect for applications which include thick and overly-filled envelopes. Milling cutting also produces a soft feathered-edge, which lends itself well to additional operator comfort. Long-established features like the Memory Verifier Unit enable accurate content status measuring. So if an operator accidentally leaves a document in an envelope, the Model 72 immediately stops running and notifies the operator. 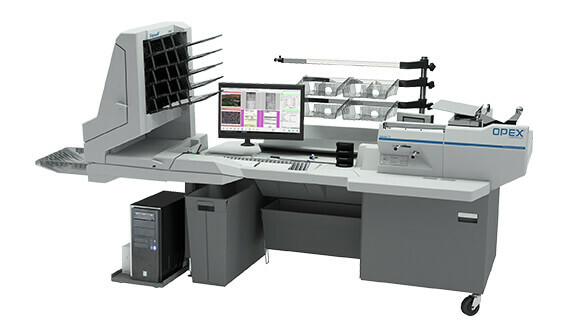 Additionally, its Thickness Profiling Verifier takes continuous readings of envelope construction, with measurement resolution and precision up to 1/10th the thickness of a sheet of paper. The entire track has been optimized for irregular envelopes. Each envelope is auto-jogged to shift contents away from both cut edges to achieve a new level of content protection. All of this results in a better ability to process all of your incoming envelopes with decreased down-time, higher quality and greater overall throughput. The thickness Profiling Verifier takes continuous readings of envelope construction, with measurement resolution and precision up to 1/10th the thickness of a sheet of paper. This enables the Verifier to read colored papers, privacy envelopes, advertising envelopes and other formats to ensure utmost reliability and security. Running various thicknesses of envelopes intermixed is simple. Intermixed envelopes often contain an unpredictable number of documents inside. The feeder automatically adapts, on-the-fly, to varying envelopes and reliably transports the envelopes through the track. The Memory Verifier Unit enables accurate content status measuring. So if an operator accidentally leaves a document in an envelope, the Model 72 immediately stops running and notifies the operator.